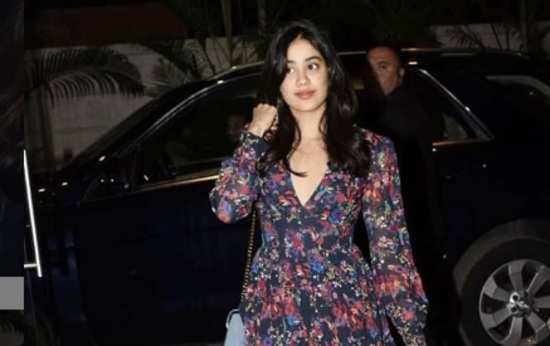 Janhvi Kapoor recently stepped out looking flawless even though she chose to go make-up free. The Bollywood star recently made an appearance at the screening of the film 'Ek Ladki Ko Dekha To Aisa Laga', which her cousin and actress Sonam Kapoor is starring in. For the event, Kapoor wore a floral red and blue mini dress with a V-neck. She chose a shoulder strap clutch handbag and light blue high heels to complete the look. Her makeup was practically non-existent and she let her flawless skin do all the shining. Her hair was impeccable and flowy - the perfect style for the outfit. The daughter of the late screen star Sridevi and producer Boney Kapoor made her Bollywood debut with the film 'Dhahdak' in 2018. Fans have not only fallen for her talent but also her trendy, always on point style. Just take a look at her Instagram account and you can see why she has become a huge fashionista. She knows when to keep it simple and when to go all out in gorgeous bold colours. The actress will next be seen in Karan Johar's upcoming film 'Takht'. Janhvi will star in the movie alongside Vicky Kaushal, Ranveer Singh, Ali Bhatt, Kareena Kapoor Khan and Anil Kapoor.The star is also reportedly working on the upcoming Gunjan Saxena biopic. 5What Nick Jonas gave Priyanka Chopra's bridesmaids in exchange for his joote will leave you stunned!